﻿UPATE June 20th﻿- The tournament has been postponed to 2016. Although USA duos loved the idea of the tournament, the choice of July 4th, their national holiday was not a good date. All registered players will be refunded through paypal. DETAILS - 2 v 2 format. Exciting day long tournament. Only $60.00 (canadian) a duo to register. Each partner registers separately. Click on button above. It only takes 2 minutes. EMERALD LAKE is one hour 45 minutes from Buffalo border. Two hours from Port Huron Michigan, Three hours from Detroit. BONUS#1 -USA duos get free tank tops to help celebrate their holiday weekend! BONUS #2 : It is $8.00 per car to enter the grounds but we have secured a deal where all registered players and their families get into the waterpark also at no additional charge! So cool off after a fun day of volleyball. BONUS #3 - Free Practice Sessions Friday Evening. 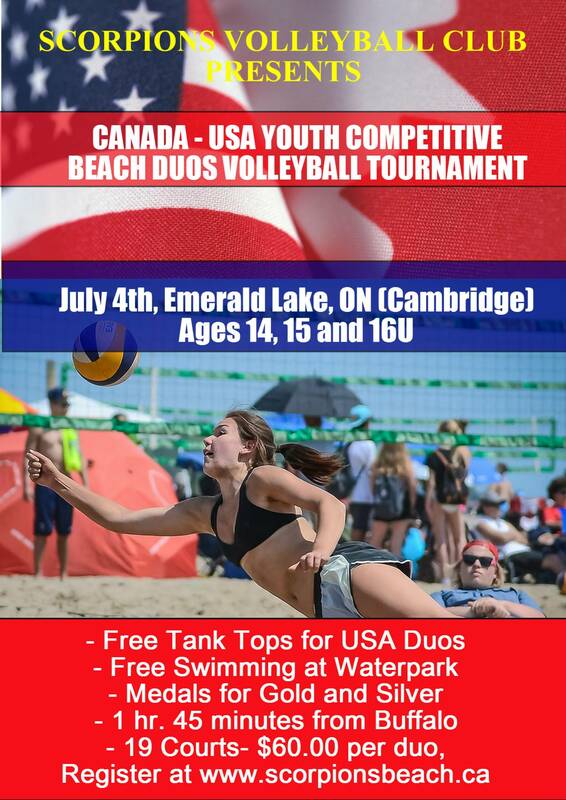 Emerald Lake is a private campground with waterpark 15 minutes from the City of Cambridge volleyball club.It is also the summer home of our competitive beach program. We have 19 courts in a beautiful setting.